Miho Nishida ignites social media with her \"new look\"
Miho Nishida ignites social media with her "new look"
Miho Nishida during the Haunted Forest mall show last Friday, December 9 (left) and her runway stint at Bench Under The Stars fashion show last November 18. Notice something different about her facial features? 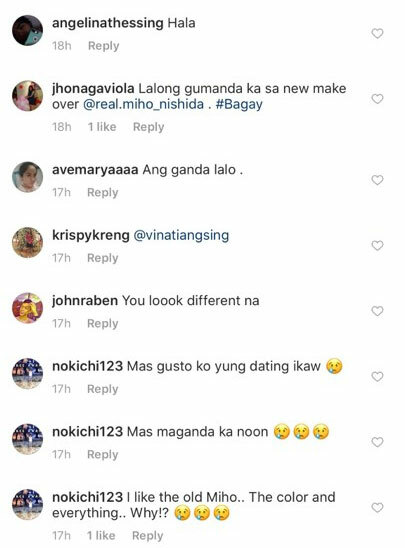 Former Pinoy Big Brother housemate Miho Nishida is stirring up speculations among netizens because of her "new look." Some of her fans and Instagram followers have noticed something different about her face, particularly her nose. In an Instagram post last December 3, the 24-year-old celebrity mom uploaded her selfie with her rumored beau JV Kapunan and Filipino-American comedian Jo Koy after the latter's show at Solaire Resort & Casino. Her Instagram followers were surprised to see her "new look." Some pointed out the sharpness of her nose, as well as her whiter skin. Miho has also been attending some public events after she posted the selfie. Last December 8, she was spotted at the grand opening of Society Eight PH at España, Manila, with JV. Miho has also been doing some mall shows to promote her Metro Manila Film Festival 2017 entry entitled Haunted Mansion. Last Friday, December 9, she attended two mall shows to promote the film. The first one was in Ayala Cloverleaf Mall in Balintawak, Quezon City. It was followed by a mall show at SM Marilao in Bulacan. The photos showing her "new look" were posted after her runway stint at Bench Under The Stars denim and underwear fashion show last November 18, at the SM Mall of Asia Arena in Pasay City. Given the time frame, some netizens were quick to speculate that Miho may have gone through a non-surgical nose job or had nose fillers after the fashion show. A normal rhinoplasty would take at least three weeks to a month to fully heal. She definitely looks different, but still pretty.